. Fung HB, Stone EA, Piacenti FJ. 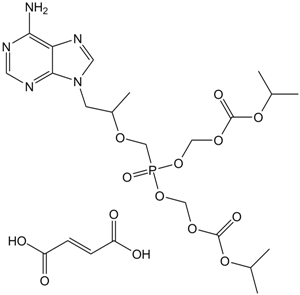 Tenofovir disoproxil fumarate: a nucleotide reverse transcriptase inhibitor for the treatment of HIV infection. Clin Ther. 2002 Oct;24(10):1515-48. Fung HB, Stone EA, Piacenti FJ. Tenofovir disoproxil fumarate: a nucleotide reverse transcriptase inhibitor for the treatment of HIV infection. Clin Ther. 2002 Oct;24(10):1515-48.